I made a 2 foot monkey and named him Darcy. 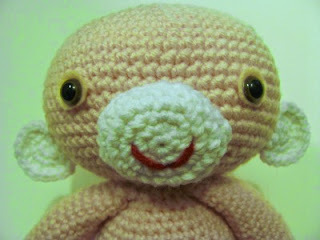 He is made with Boucle yarn plus worsted weight yarn held together. I knew I needed a video tutorial to go along with his pattern but when I first attempted it I realized it would be really hard to make a video with him being so big so I decided to follow Darcy's pattern and use one strand of worsted weight yarn and a smaller hook and make the tutorial that way. So what you get now is a 2 in 1 pattern! Or is it a 3 in one pattern? I decided to also re-make Darcy with 2 strands of worsted weight yarn so you can still get your 2 foot monkey even if you don't use Boucle yarn! 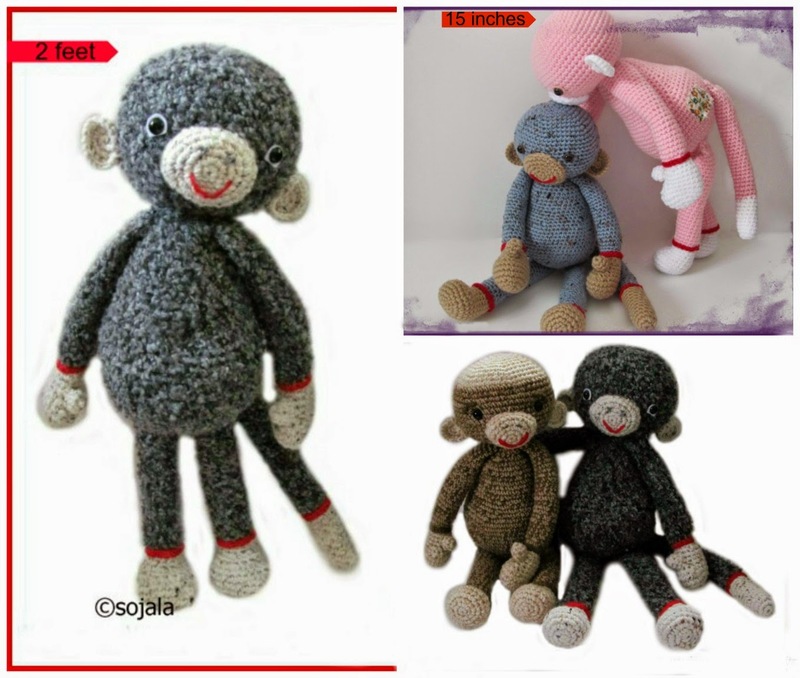 Pictured below is Darcy grey monkey standing (made with Boucle) and Brandon sitting with a lighter colored head. Pictured above and below (pink and blue) are the 15 inch monkeys made with one strand of yarn. So depending on what you use you can get a few different versions and sizes of one monkey, pretty cool right?! Instead of re-writing the entire pattern I will give you the modifications you need to make the smaller monkey and also the pattern to get the lighter colored cap on the head like Brandon pictured on the left above. You will need to print off Darcy's pattern and use the modifications here on this page. Look for the printer friendly button at the bottom of the pattern. Then you can use those to follow along with the video tutorial here. (Once you click on the printer friendly button you can choose to print without images which will save you on ink). 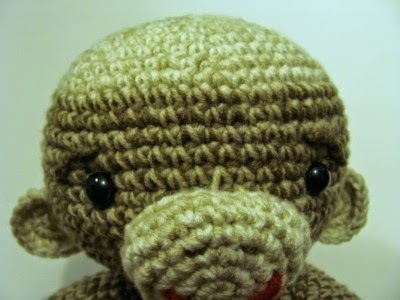 To make the smaller monkey which comes out to about 15 inches tall use worsted weight yarn and a 3.5mm hook. To make Darcy with the fuzzy coat use Boucle yarn and worsted weight yarn held together and a 5.00 mm hook. To make the a monkey like Brandon which comes out to just under 2 feet tall use 2 strands of worsted weight yarn held together and a 5.00mm hook. sl st next st and f/o leaving a long tail for sewing. You can leave the muzzle un-stuffed. Put the mouth in before sewing onto the face. See video if you need help on how to do this part. The Eyes are up to you. I decided not to add eye patches like many of the crocheted monkeys out there but if you would like eye patches on either the smaller or larger monkey then make two patches by following the same pattern to make the ears just don't fold over the edges. If you use safety eyes then attach those to the patches before sewing the patches to the face. If you like the placement of the eyes as seen on both sizes of monkey and without patches then install those in between the 15th and 16th row with about 12 to 14 stitches between them. If you use safety eyes then remember to put those in before stuffing or closing up the head. And that's it, that is the only modifications made. The video tutorial is a stitch by stitch guide for those of you just beginning in crochet or amigurumi. Thanks for viewing and I hope you get a monkey made, this world needs more monkeys! hi sharon this are my to monkeys I made!!!! i change some things to give them a diferent look, but i think they turn out adorable. Thank you so much for the patter it was very fun to make this. I do have one request, do you think you can create a pettern for a cute dress for the monkey girl, and maybe some overalls and a cap for the boy? how do you post the pic? the eye size and supplies list is in Darcy's written pattern. And which small animals? Some yarns can't be machine washed but acrylic can be wash inside a pillow case. Hang to dry or put inside a pillow case to dry. You could also google "washing amigurumi" and there you will find more tips. Nevermind my previous post. I see your video is in a different order than the written instructions. The video starts with the body, and not the head. My error.